Occurrences of swinging one's elbows arrogantly are at their lowest levels in decades. NEW YORK—According to an alarming new study published Monday in The Journal Of Applied Behavioral Science, the time-honored American activity of swaggering, an extremely arrogant manner of walking, has dropped by nearly 90 percent since 2007. 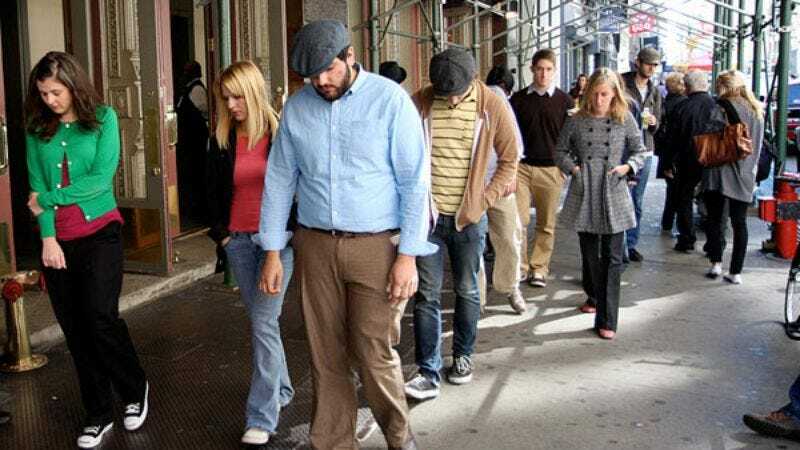 The study, which observed random cross sections of ambulatory subjects in three major metropolitan centers, including New York, Chicago, and Houston, found several worrisome deficiencies in once-cocksure American walking. "The average stride has decreased from 2.5 feet in length to mere 11-inch shuffling steps, and the angle of a walker's torso in relation to his waist has gone from a confident 28-degree backward lean to a pitiful 67-degree bent-over slouch," Macleod said. "Perhaps most distressing is the near-total absence of Americans making imaginary guns with their fingers and 'shooting' at passersby while winking." Macleod said that his research team witnessed several other behaviors directly related to the decline in swaggering. Most notably, moping is up 67 percent, and is often accompanied by head-hanging and the jamming of one's hands deep into one's pockets. In addition, the practice of sheepishly kicking a tin can down the street was exhibited by 22 percent of those monitored. Macleod theorized that slinking is likely on the rise as well, but was careful to point out that those walking in this manner are adept at passing by unnoticed and are thus extremely difficult to observe. Dr. Thomas Ewell, an expert on boastful walking styles throughout American history, said he is not surprised by the overall decline in public swaggering. According to Ewell, pompous walks have always been adversely affected during times of national turmoil. "It's cyclical—different modes of presumptuous sauntering come and go," Ewell said. "For example, popular 1920s walks, which included cavalier watch-chain-twirling, the hooking of one's thumbs into one's suspenders, bowler hats cocked to ridiculous angles, and exuberant heel-clicking—both single and double—were more or less eradicated by the Great Depression." "Even the strut, perhaps the cockiest walk that ever existed, was all but wiped out by the Vietnam War and the energy crises of '73 and '79," Ewell continued. "This exceedingly self-assured ambulatory method, once dominant across America, is now almost exclusively performed in a facetious, exaggerated manner designed to make one's friends laugh." Ewell added that he remains certain that the country will "once again find its way in terms of smug, over-important walking" when it inevitably returns to reckless consumer spending and invading weaker nations. Still, of the small percentage of Americans who continue to make regular use of haughty walks, many are pessimistic about the future of the nation's brazen locomotion styles. "I'm swaggering harder than ever just to keep up appearances, but I think people can tell that my heart isn't really in it anymore," said Staten Island, NY resident Vincent Reda, his insolent smirk betrayed by a certain sadness in his eyes. "With the country in the shape that it's in, I just don't know how much longer folks like me will be able to hit the streets and really shove it in people's faces with arrogant walking." "It's scary to think about where this country is headed," Reda added. "Being huge, conceited jerks is all we know."